So close to Europe and yet an age away, Morocco is our nearest opportunity to see an Islamic culture and lifestyle totally different to our own. Walking round the narrow streets of Marrakech or Fez you’d also be forgiven for thinking you’d gone back in time. Donkeys and bicycles push past you in narrow souks that are filled with sounds and smells that take you away from modern life. Mountains of spices sit next to exotic carpets and irresistible lanterns. Not many people return without their full quota of luggage. Emerging into the main square of Marrakech, Djemaa el Fna, the senses are assailed anew with food stalls and snake charmers. Yet all this is in total contrast to what lies behind thick stone walls. You will never forget stepping through a small door into a riad for the first time and marvelling at the courtyard within, bougainvillea and ancient palm trees, fountains and orange trees and just the resident tortoise to be mindful of. The profusion of activity in the towns can stop you looking up and beyond. On clear days the Atlas Mountains seem touching distance away from Marrakech and indeed you can be in the foothills in 40 minutes. The intrepid will take on Mount Toubkal, even go skiing, others may be content to wander through the mountain villages before returning to lunch with a view. Many are now taking the time to head down through the mountains to the gorges and valleys, oases and Kasbahs which ultimately lead to the Sahara itself. Why not start in Fez and take in the old imperial cities of Meknes and Rabat too. The coastline of Morocco also offers many different options. Agadir is everything a beach resort should be, with watersports and golf to compliment the sun, sea and sand. Essaouira, once the 60’s hippie hangout, is now a popular place to head for, to escape the heat and enjoy the galleries and sea food restaurants. 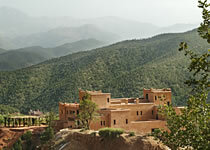 Morocco now caters for everyone, romantic weekend, groups of friends and family holidays. For all its vibrancy and exoticism it also feels safe and welcoming making it the perfect escape from the western world. Day 1-3: Arrive into Marrakech airport and transfer straight to the mountains for 3 nights. Both properties offer a range of activities such as trekking, village visits, market days, mountain biking or daily excursion with private driver. Day 4-6: Transfer into Marrakech for 3 nights. Explore the souks and experience the atmosphere of the main square, Djemaa el Fna, as darkness falls. Then move out to the newer part of Guerliz where French Riviera and cafe society meets morocco. Finally return to your riad or hotel, sit on the rooftop terraces and listen to the call to prayer from the muezzins and you know you’re somewhere totally different. Prices from £250 per person for international flights. This itinerary is approx £735 per person including flights and transfers staying at Bab Ourika and EL Fenn on a B&B basis. Where you stay in Marrakech is a huge part of the experience and there is a vast choice at every price so call us for ideas.